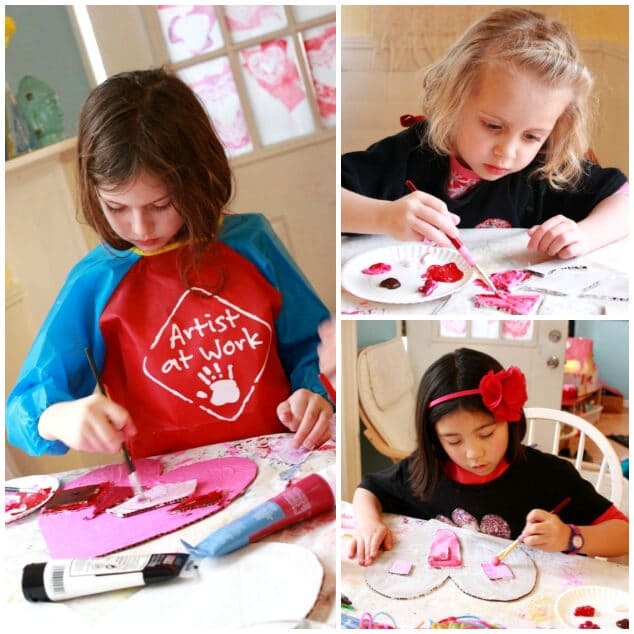 Cardboard Art Projects for Kids —Modern Art from Corrugated Cardboard Scraps! This series of cardboard art projects started both as a way to use cardboard scraps and to keep my younger daughter happily occupied (and, yes, quiet) while the older one did her homework. However, it quickly turned into one of many modern art pieces that have been made by both kids as well as a couple of their friends, hung on our walls, and turned into Valentine gifts. Besides looking awesome, these cardboard art projects are a fun way to recycle cardboard boxes and cardboard scraps into wall-worthy modern art! We used corrugated cardboard scraps left over from the cardboard dollhouses we made recently—box flaps that had been cut off and window pieces that had been cut out. But you could just as easily cut up a single cardboard box that is headed for the recycle bin and offer it up to your kids for art-making. 1. Use scissors or utility knife to cut out your basic background shape out of the cardboard—square, rectangle, heart, whatever (a grown-up job). 2. Cut out smaller pieces of cardboard into random geometric and/or amorphous shapes (a grown-up or big kid job). 3. Use the glue gun to glue the smaller shapes onto the background shape as desired. A Note about Glue Guns :: If you’re unsure about letting a child use a hot glue gun, read this post on glue guns versus white glue by Teacher Tom, my interview with him, or page 181 of my book (more tips from Teacher Tom on kids using glue guns). My 4-year-old handles a hot glue gun safely and successfully and really loves the control she has with it. You might be tempted to get a cool-shot glue gun, thinking it’s safer, but I’d recommend against it. They are really hard for little kids to squeeze and the glue hardens way too quickly, basically making them unusable for this purpose. Wait until your kids are old enough to understand that the tip is hot and could burn them if they aren’t careful, then just get a regular hot glue gun. I suggest buying a mini size hot glue gun to use with little kids (easier to squeeze) and a regular size glue gun for older kids. 4. Continue adding cardboard shapes, and even layering them, as desired until you are satisfied with the design and layout. 5. Paint the cardboard art piece! We used acrylic paints, which worked great on the cardboard, but you could also do it with BioColors, Activity Paint, or Tempera Paint. I gave some of ours a coat of gesso first and some didn’t get the gesso — I think either is fine. Let dry. The kids seemed especially inspired by painting the different raised cardboard shapes. 6. Add drawings, scribbles, and doodles on top of the painted cardboard art if desired. Daphne drew on top of the paint on some of hers and also drew directly on the cardboard on others. She has recently been making very detailed drawings with lots of hearts, spirals, flowers (where’ve I seen that before?! ), fairies, and storytelling elements. 7. Turn the cardboard art piece over and use the hot glue gun to glue the ribbon on as a hanging loop. Glue gun question :: Do you let your kids use a glue gun? What do you think? How about your kids? Do they enjoy using one to create and build? Next Post Paint with Water :: Easy, Low-Mess, and Fun! In our kindergarten arts program, we put out kids mittens from the dollar store. The children feel safe to try the glue guns and are still able to manage handling the bits and pieces they are gluing. Success! Thank you for this idea… it is what we will do today! As for the glue gun question… after reading your book decide to let my 4 year old have a go at it. He has been so safe, and it has really empowered him. I’ve seen the experience carry over into other areas. “Mom, I can do dangerous things because I’m careful and a good listener!” This from a boy who is overly safety conscious (i.e. must hold hands on the sidewalk of a quiet residential street because a car might come) and quite timid about anything new.